Potter Phil Sellers chairs this year’s event. 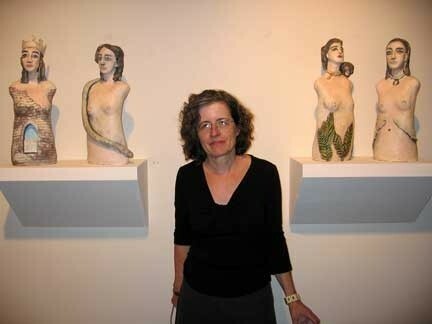 The artist Diane Sullivan seen here with her work organized the first Open Studios in 2005. 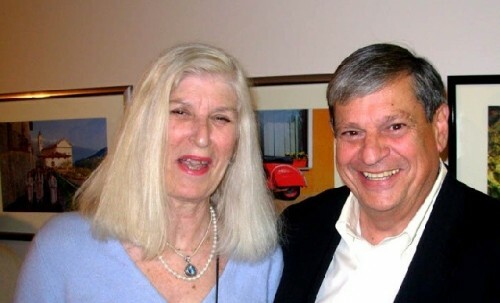 The 2006 chairperson, artist and antiques dealer, Jane Hudson, with North Adams Mayor, John Barrett. 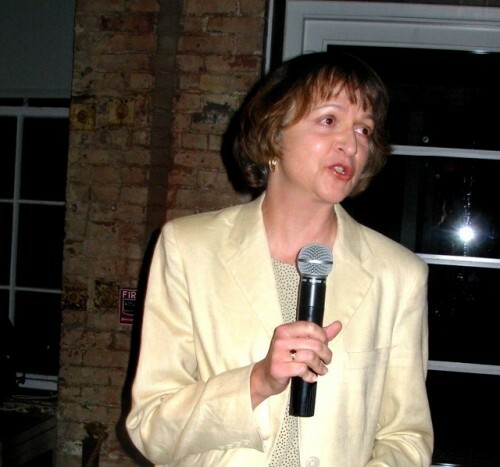 Sharon Carson chaired the event in 2007. 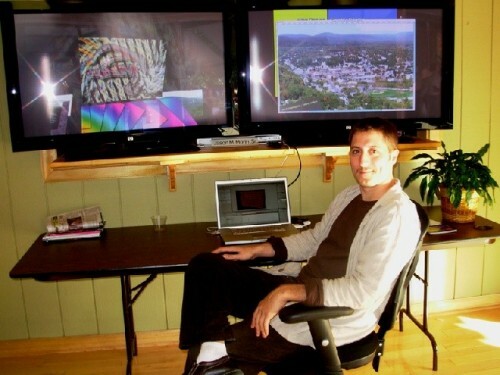 Jason Morin co chaired with Jessica Conzo in 2008. Morin outside the Beaver Mill. Hezzie Phillips greeted visitors to the former Contemporary Artists Center in the Beaver Mill. The artists Joan Kiley and Norm Thomas showed their work in the Eclipse Mill. 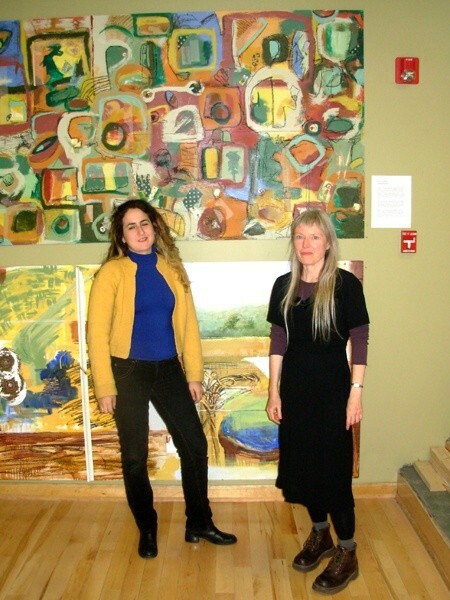 The artists Jaye Fox and Karen Kane showed together in a downtown space. Ralph Brill in his gallery in the Eclipse Mill. Works by Jean Noel Chazelle in the Delftree studios. 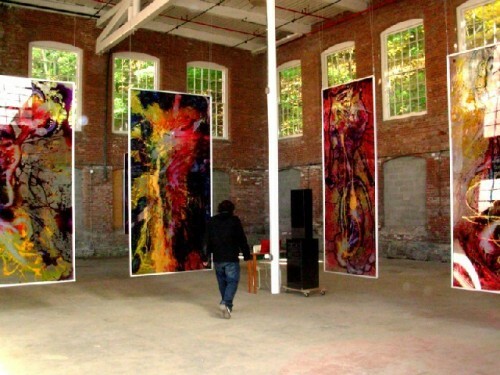 In 2005 the artist Diane Sullivan and a committe of neighbors at the Eclipse Mill organized the first Open Studios event. Initally it was a fairly modest undertaking. Many who made the rounds on that first October weekend were mostly curious about the artists who lived in the former factory in North Adams. 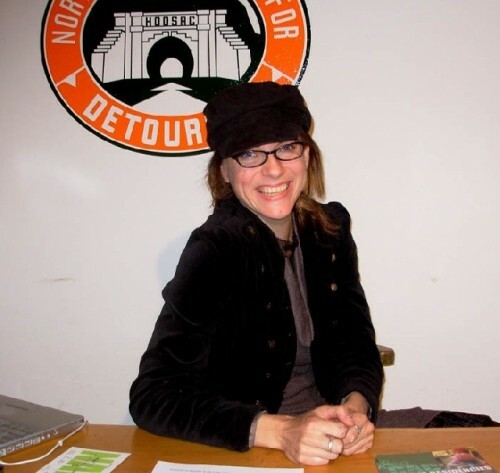 In 2006 Jane Hudson, an artist and with her husband Jeff an antiques dealer, chaired the event which expanded from the Eclipse Mill to become a larger city wide project. This trend continued under the next chairperson, Sharon Carson, in 2007. There were spaces in the downtown area as well as the Beaver and Windsor Mills. 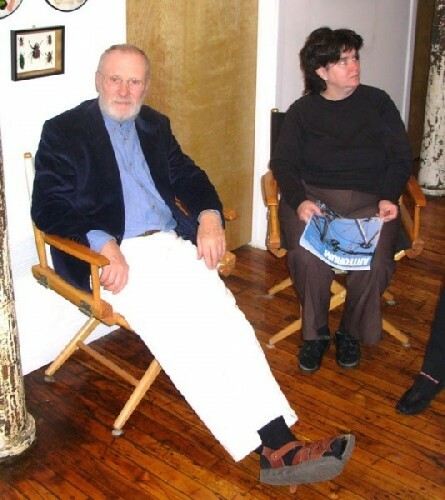 For the 2008 event, chaired by Jessica Conzo, of MCLA, and Jason Morin, Open Studios became even larger. It included the summer long galleries of DownStreet which have returned this year in an expanded form. There were also many artists booths and installations in the Delftree complex which is on the other side of Route Two across from the Eclipse Mill. This greatly increased the number and variety of participating artists. For the North Adams Open Studios which will be held with a reception on October 16 with the event on the17th and 18th this year the chairperson is Phil Sellers. With his wife Gail they run River Hill Pottery in the Eclipse Mill. He has many ambitious plans for the now established and popular undertaking. The Cultural Council of Northern Berkshire announced today that North Adams Open Studios (NAOS) is one of seven projects across the state to be honored by the Massachusetts Cultural Council (MCC) with the Gold Star Award for excellence in community arts and culture. A reception and award presentation, free and open to the public, will be held on Wednesday, September 16 at 6 pm at the Eclipse Mill, Route 2, North Adams, MA. For one weekend in mid-October, local residents and tourists can see work by dozens of artists displayed in permanent and temporary galleries as well as private studios. for a Gold Star Award every year," states Sandra Thomas, Co-Chair of the Cultural Council of Northern Berkshire. "North Adams Open Studios has developed a tradition of providing quality artistic experiences while collaborating and engaging the community on many levels with businesses, the municipality, art venues, educational institutions, volunteers and the community at large. 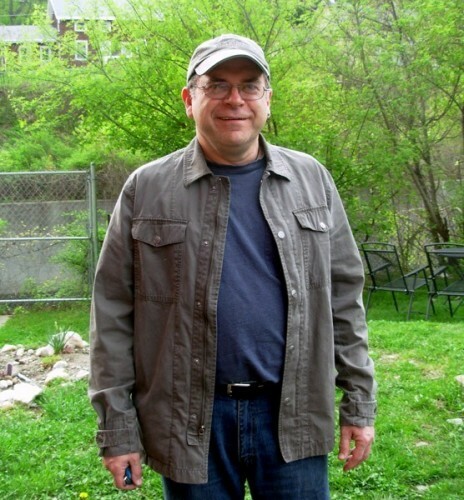 The volunteer-run project has done an outstanding job of exposing those of us who live here, and those who visit North Adams, to the spectrum of artists who live and work here too. It's a valuable addition to our cultural offerings and it's exciting that NAOS is being recognized at the state level." The Gold Star program annually recognizes model community arts, humanities and science projects funded by the 329 Local Cultural Councils across the state. "Open Studios began with a half dozen artists opening their studios at Eclipse Mill Artists Lofts in 2004 and after just a couple of years we had so many artists interested in participating that it became clear that we needed to add more sites," Sharon Carson observed. "As a citywide event North Adams Open Studios finds new ways each year to fulfill its mission to inspire and enliven the community through the arts. The MCCs recognition of our event shows how far the North Adams art community has come in a short time." 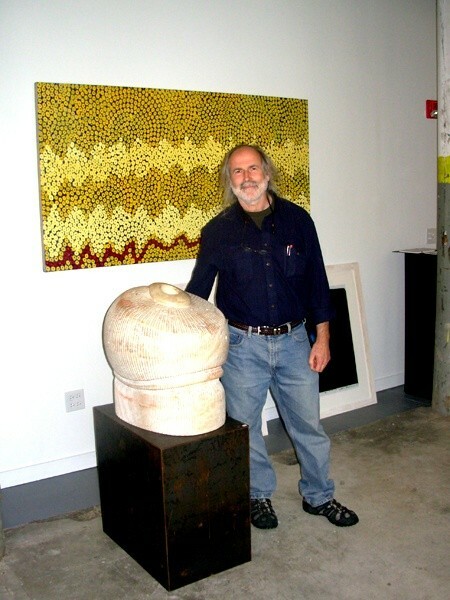 Phil Sellers, of River Hill Pottery and the chairman of NAOS 2009, appreciates how Open Studios makes connections in the community by "showing the public the creative part of our community It's an opportunity for professional and non-professionals to share their lives and work with people who are looking to make the connection. It's about involvement with the community as a whole." artists will join the weekend celebration, showing their latest creations in many downtown store fronts and galleries, and at Eclipse Mill, Heritage State Park, Windsor Mill, Kolok Gallery, NoAMA, North Adams Regional Hospital, and Beaver Mill.